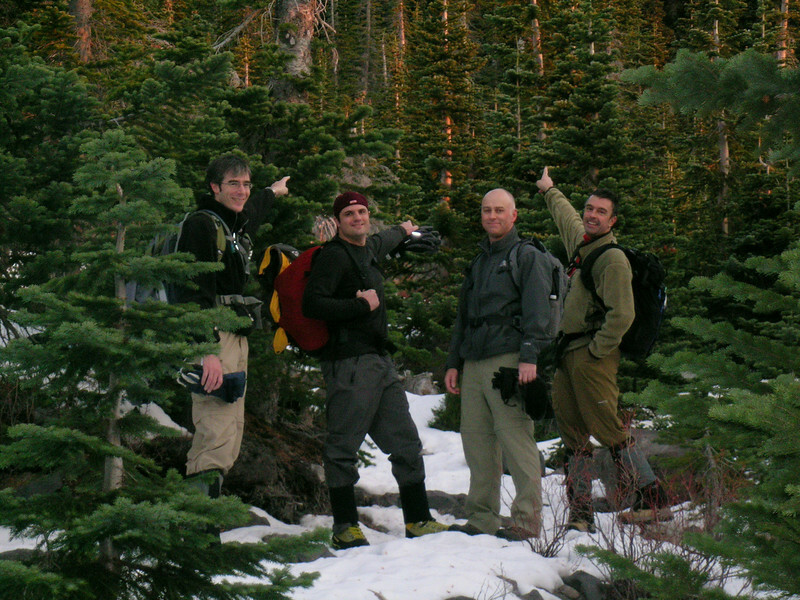 We were a group of seven; really great mix of hikers. We started at Climbers Bivouac and hiked Monitor Ridge up the south slope. It was a PERFECT day! Sunshine, no wind and I was wearing a t-shirt at the top! The snow was hard pack in the morning and did get a bit soft by afternoon. Overall, great conditions. No snowshoes or crampons were needed. The hike was a bit more challenging than I had thought it would be; a lot of rock scrambling in sections making the hike back down hard on the knees. In fact, I strained my left knee immediately after leaving the top so I slowed down my pace as to not make the injury worse. The view looking into the crater is awesome. There was some steam coming from the lava dome which has grown tremendously in recent years. What a spectacular site! We were back down the mountain by about 4:30 in time for a great dinner just a short distance from the trailhead...good times had by all. Just starting out (these guys know which way to the top)! Andy Jones, Bobby Adair, Ian Poleykett and Curtis Crothers.